Housewives is a guilty pleasure, but Atlanta? Where is the Texas love? I know we have got a pack of robot housewives in my neighborhood… Ha! This will be interesting. According to the info, all of the housewives are from the suburbs (affluent suburbs, but still, suburbs)…not from Atlanta (or from Buckhead, the ‘Beverly Hills’ of Atlanta). That would be like having a real housewives of Houston and no one is from River Oaks. 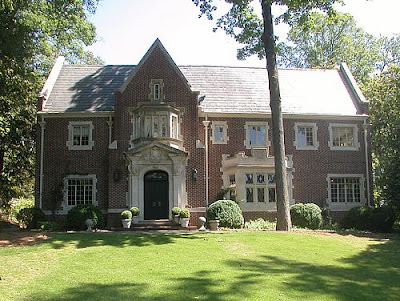 By the way, the house in this post is from one of the oldest parts of Buckhead…we will definitely not be seeing any houses like that in the Real Housewives of Atlanta! I bet that these housewives live in brand new 10,000 sf + McMansions in gated communities. Aww, TTI! That’s too bad, but it makes sense. I would imagine that most of the women who would sign up for this sort of thing would be “new money” and not part of the old guard that resides in Buckhead. Is there going to be a “Real Housewives…” channel someday? It’s getting a little crazy. I love the Real Housewives…. all of them, but I am beginning to think when is enough enough. I had a chance to catch the preview of the ATL version and I must say I am appalled. First of all, two of the women aren’t even married, but they are “real housewives” PLEASE!!!!!! And of the two that aren’t married one’s boyfriend, “Big Poppa”, doesn’t want to be seen in public with her. She can’t even say his name!!!! (maybe it’s the horrible wig she wears). ARE YOU SERIOUS???!!!!!!!! It’s not a stretch to say that on previous housewives the women, for the most part, worked and were independent (i.e. Vicki, Gena, Tamara, Bethany, Jill, etc.) but the majority of this crew is living off the riches of their successful husbands. Can someone tell me why Eric Snow’s wife has to hire a huge staff to manage her home (a home that she didn’t even take the time to design, so what we see isn’t even the real person) and raise her kids? What else does she have to do that she can’t do those things herself (charity work, event planning, a clothing line, etc. don’t count)? She says she knew she was destined to be great since she was a child. Is she so great because she married a basketball player? ARE YOU SERIOUS????!!!!!! And my girl Ne Ne……good grief….. she is just excited that her older successful husband saved her from the hood. She’s loud and just happy to be there….. a mess!!!!!! Sheree, the diva, says that she lives the life that others want. What’s so great about waiting to get a settlement from a man that no longer wants you. It’s no wonder why he doesn’t. In my opinion, the “real houswife” thus far is the football player’s wife. At leat she has a job. And to the other posters money is money, new or old I’ll take it. Anon, you are spot on! It’s like you read my mind. You are cracking me up, girl! I do agree with you about this all getting to be too much, but I must admit, I am looking forward to the New Jersey edition. I’m hoping for a bunch of Carmela Sopranos. How hilarious would that be? I have to agree with anonymous. Mrs. Snow, for real, she is going to hire all those people? Ms. Sheree Leakes she looks like drag queen, her attitude is disgusting. Ne-Ne, the hood rat. Here name tells it all. It’s cool to have a nick name but you would think for the show she would use her name (ghetto). Lisa Hartwell, is the only one that has something going on. It doesn’t look good on her part to even associate with the rest of them. It looks like it is going to be a hotlanta mess! Unreal. I caught the preview special today and won’t be watching it the rest of the season. As was mentioned, these women do NOTHING but spend money (boyfriends or EX-husbands)to feel important. These are all the exact type of people that spend spend spend and then look for others to bail them out and for the mess they are in.